Vacuum systems will have an important role to play in ITER. The sheer size of the machine poses a challenge in delivering the right level of vacuum to its different components. Take for instance its vessel, with an interior of 1 400 m³, which will house the fusion reaction; the neutral beam front components, with a volume of 150 m³, which will be used to heat the super-hot plasma; or the massive cryostat, the largest stainless steel chamber ever built measuring 16 000 m³ with a pump volume for 8 500 m³, to isolate the ITER vacuum vessel and the superconducting magnets. All of the above will need to remain leak-tight, operate in vacuum and rely on a system that is able to detect and localise possible leaks. Can you imagine how difficult it must to perform these tasks in a labyrinth of equipment? 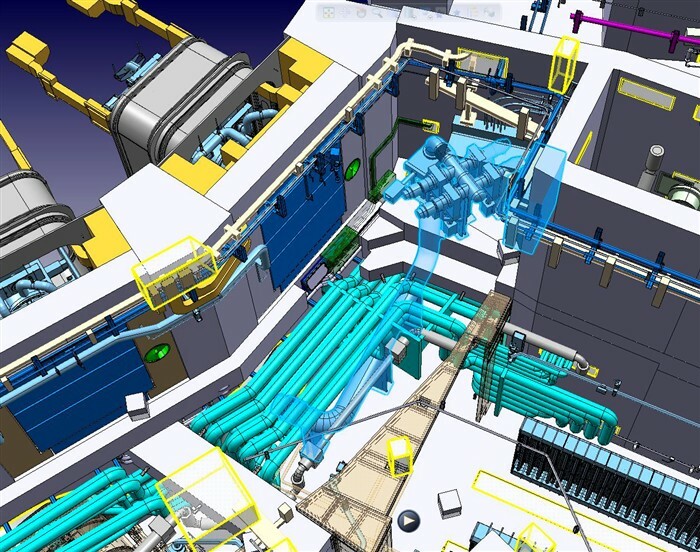 F4E has signed a Procurement Agreement (PA) with ITER Organization to develop a final design which will be used to manufacture the leak detection system for primary vacuum of the neutral beam and vacuum vessel, as well as the leak detection system for the cryostat. At a later stage, F4E will procure the Helium leak localisation systems for the cryostat and the leak detection tooling for the in-vessel components. The connection pipes that will be used for the leak detection system will be approximately 14 m long and have a diameter of 0.5 m. The reason being, the bigger the diameter of the pipe the faster technicians will be able to detect a leak. The detection units, on the other hand, will have to fit in a very restricted space. Roger Martín Fernández, managing this contract on behalf of F4E, took the opportunity to explain in broad terms the nature of the equipment and some of the main challenges. "The leak detection systems will rely on mass spectrometry instruments using Helium as tracer gas, which is standard technology. However, in the case of ITER the equipment will need to cope with strong seismic loads, radiation and significant magnetic fields. This is where things will get more complicated. We will be working closely with the vacuum industry, giving all the necessary support to design and manufacture these systems, ensuring that they comply with the strict standards enforced by the French Nuclear Authority."